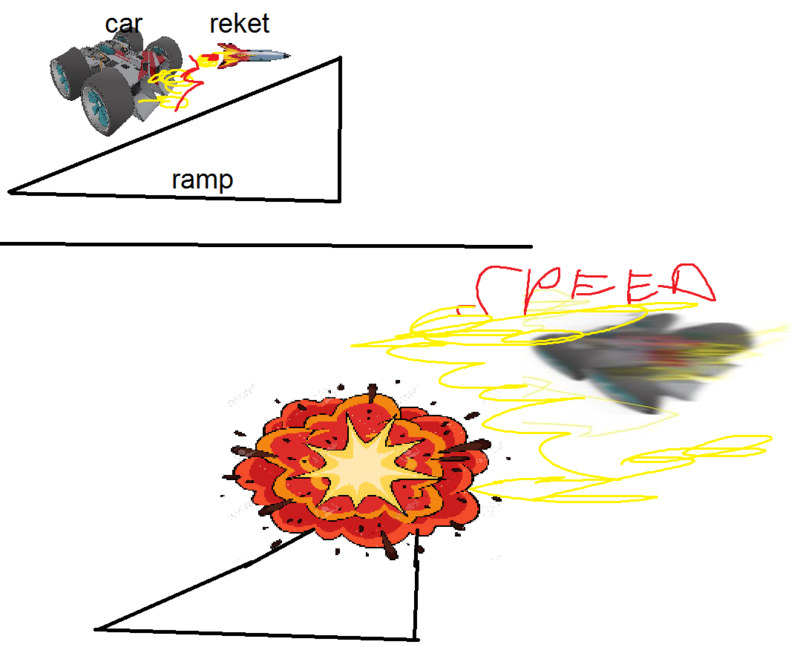 this is GRIP's/RC's signature move we're talking about. I get what you’re saying Quead, for me, if anything the level feels a bit 'platformy' and not really grounded in place (RC1's tracks were very grounded and RC2 less so - no doubt this is to do with dev resources) but honestly if reusing and redressing assets means more tracks, I'm pretty ok with that. - More natural changes in elevation. Daytona in RC1 is a great example of what I mean. One of the best tracks in any RC game. I love the way that you need to control momentum through the peaks and troughs of the track and the way that the physics play with that final big jump before the finish line. It’s poetry. - Wider sections and points of interest that require some cleaver negotiating. I forget the name of the track but it’s in RC1, set on Harpoon, there’s a ship loading dock with a crane and sea containers that can be destroyed. Sections of eruption and contact on outworld are also great examples. 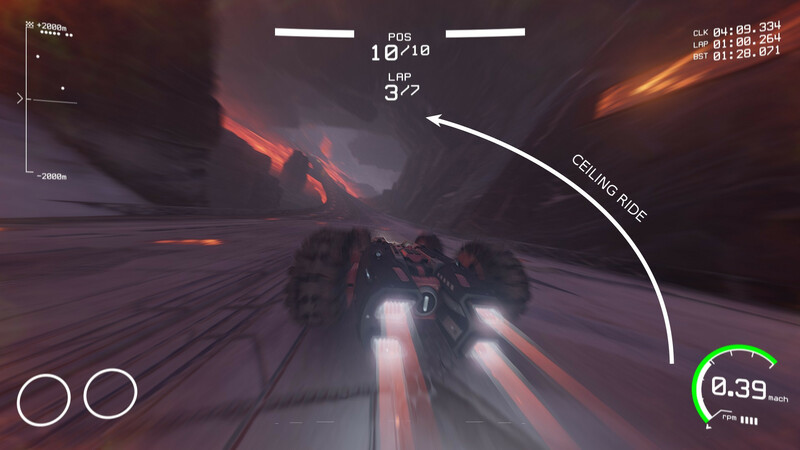 - And I have to agree with you man, more epic ceiling rides on tracks grounded in place that don’t feel so much like a roller coaster/wipeout style tracks. @playabot: That's smugglers, aka one of the best tracks in Rollcage (if you can master it. Else it's a nightmare :p). After going knee-deep into Thermo, I have to agree with you Queadah. Tracks will get tweaked either way, I mean Acro got a new alternate path a few months after it was delivered, but it's good to call out potential improvements anyway. A ceiling ride in that section could be a very dramatic visual element and depending on how it's laid out a gameplay improvement to offset the relatively bare road at the ground level. It's hard to describe. Something about the way it straddles the line between control and being out of control. Could GRIP benefit from a loosening of control? Take these bad boys off the rails and give them some room to move!! You know I do like it a lot but I feel like there could be a branching path in the lava zone. Mostly a branching path or having the Acrophobia sections be more noticeable. 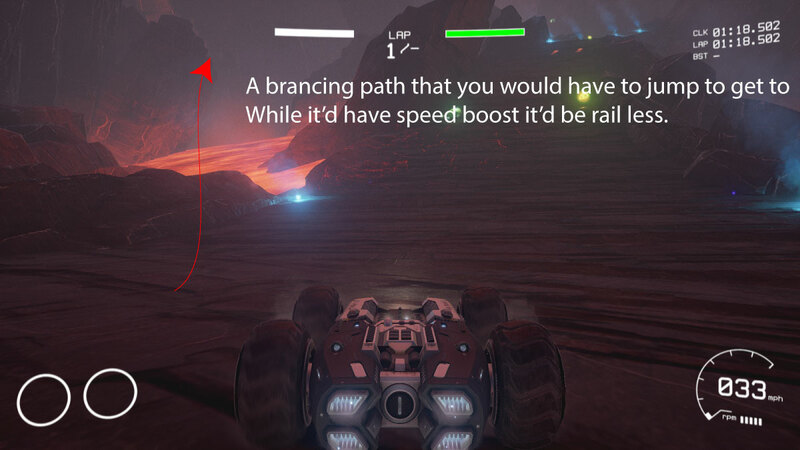 @playabot: That's the 'natural drifting' Wrob3l mentions a lot and it's also the reason why almost everyone prefers Rollcage 1 over Rollcage 2. The way you describe it matches the feeling perfectly; you're always in control, but barely. One moment you're understeering, the next you're oversteering and drifting around corners (actually drifting, none of that automatic press the handbrake once to initiate 'drifting-mode' trash). Loosening control is not the way I'd describe it though. More like give more control over the cars in GRIP. @Queadah: An attempt has been made at incorporating ceiling rides into Thermophobia, but it didn't flow right. To be blunt the entire cave would have to be redesigned. This isn't the last lava track though. @XT3: Destroyable roads à la Split/Second isn't a design goal for GRIP and personally I don't see a benefit in branching there. @Costa: I really like that bit :/ How is it messy? You guys know that drifting kicks in without hitting the handbrake right? Just tapping the handbrake accentuates it. Personally, I really like the map, especially the caves and the steep, fast shortcut. First one is the Y junction with normal and upside down sections(under the track). 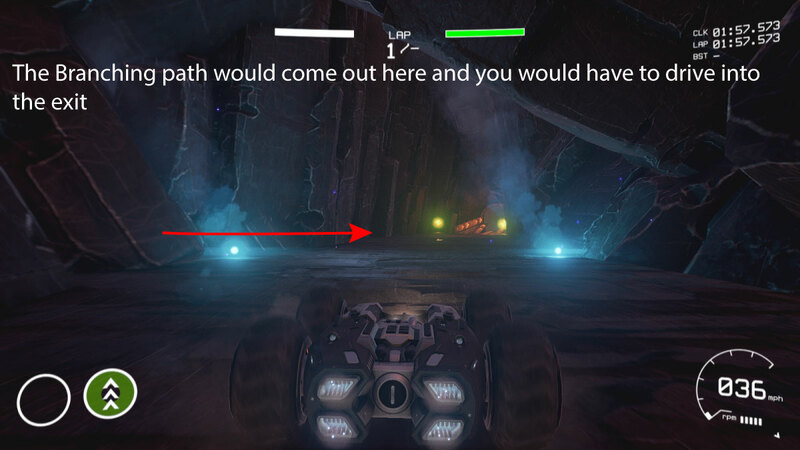 It's not too difficult to get trough this part, but in normal race, your opponents can make you fail this section, and re-spawning here could be really frustrating. 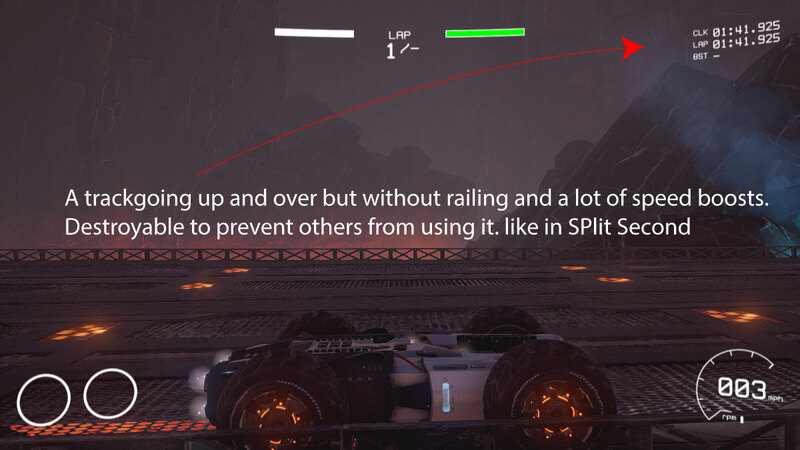 After spawn, most of the time you can't avoid falling down from the track, because you can't get a grip upside-down at low speeds, or your car is just simply pointing at a wrong direction, making it difficult or impossible to avoid driving off the track.